Thomas (1927). Fair use may apply. Dairen (Dalian; 121.577E 38.944N) was a commercial port just north of the naval base of Port Arthur. 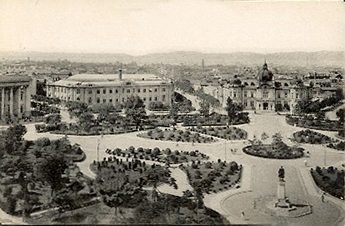 It was known as Dalian to the Chinese and Dalny to the Russians, who extensively developed it as a civilian port prior to the Russo-Japanese War of 1905. The port was abandoned without a fight during the siege of Port Arthur and came under Japanese control as part of the Kwantung Leased Territory. By 1941 Dairen was the location of a sizeable chemical works and a naval air station, and the double tracked rail line to Harbin was the heart of the Manchurian rail system. The population was about 510,000 persons. The city was also a major manufacturing center for opium and its derivatives. During the period of Russian neutrality in 1939-1941, the port was used to ship rubber and other strategic materials to Germany, circumventing the British blockade. At the Yalta Conference, the Allies agreed to internationalize the port, but postwar this amounted to joint Russian-Chinese Communist control of the port. The port was formally returned to Chinese control in 1950.